In my life many times has happened when I am assigned to a totally new project that I have no idea what it is about, that has to go live in 2 weeks and that I have to fix some issues in this ultra strange code sometimes even code written in different language. On my question is there any documentation the answer is: Yes but it is very old or no. So in short they want me to start working on a project with no documentation at all. My second question is is there a javadoc and the anwer is : yeah … kind of … so I am in a project with 30% javadoc with methods in French language for example ( I don’t know even a single word in French) so in short I am loosing 2 weeks to understand what is using what what is the model what is PersonnePhysique and what is this crazy domain model. I believe this has happened with everyone of you at least once so what can you do ? You can install intellij idea and use the great reverse engineering way to create UML diagrams for specific classes but intelliJ idea costs money. You can install netbeans 6.5 and do the same but you have to use this out dated version of NetBeans because this doesn’t exist in newer versions, thanks Oracle. You can install Eclipse + MoDisco + MDT + KML to generate xmisomething file then to generate xml file with KML thingy then to use UML2 tools to view this diagram blah. Or you can find some other way… this is the other way which I believe is very nice and useful and you should use it in every project that you can actually this should be the first thing that the architect should put in the project. 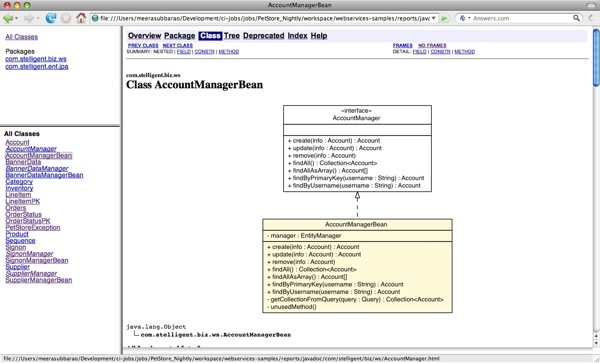 So in short the other way is to generate a UML diagrams each time when a javadoc is generated it will generate a UML diagrams for each class and package which contains whatever you want operations,attributes,constructors just names you can click on them and navigate using them it is AWESOME. 1) install graphviz on the machine that will generate the javadoc .. usually this is a linux machine which runs hudson or whatever so in case of ubuntu you just need apt-get install graphviz4 otherwise you can download the msi/deb/rpg/source from here http://www.graphviz.org/Download..php then just type “dot –-help” in console to check that the dot executable is in your path. 3) invoke mvn javadoc:javadoc … and you are done. :+) easy right ? You can see explanation about all umlgraph options here http://www.umlgraph.org/doc/indexw.html like do you don’t want to see the attributes, but you want the operations and etc..
That's pretty cool. There's also apiviz which basically does the same thing but looks a bit more modern.